I have been wanting to try making a gumbo for a while now and with Mardi Gras here I figured it was the perfect time to make one. Gumbo is a stew that is made with a strong stock that is thickened, the “holy trinity” of vegetables; onion, celery and green pepper and some kind of meat. I was dead set on going for shrimp for the meat and since I had never tried okra before I had to go with that as well. 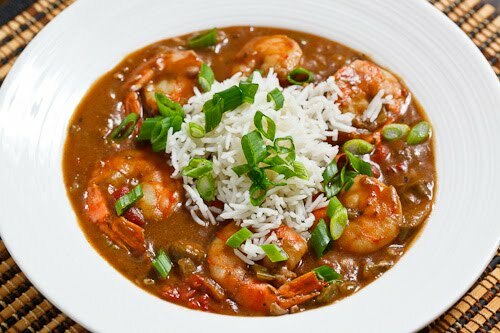 The thickener in gumbo is usually one or more, of okra, filé powder or a roux which is made by cooking flour in a fat. Since I was not too sure on exactly how thick the okra would make things by itself, I went with the roux as well. The fat in the roux is usually oil or butter but you can also go with lard or bacon grease to add even more flavour. The trick with the roux is to get it nice and dark brown without burning it since all of that browning is just adding more flavour. Since gumbo is described as starting with a strong stock, I had to go with making one myself and given that I was using shrimp in the gumbo I went with a homemade shrimp stock . I made the shrimp stock the day before to save time on the day that I made the gumbo. Although this recipe is rather long and it takes a while to make, especially if you also make your own stock, it is not all that difficult and the final results are definitely worth the effort! One important point about this recipe is that the shrimp are not added until the very end to ensure that they are not overcooked and that they remain nice and plump and juicy and good. I served the shrimp and okra gumbo topped with rice and garnished with green onions. I am definitely looking forward to experimenting with more gumbo recipes in the future! Heat the oil in a large sauce pan over medium heat, sprinkle in the flour while mixing and simmer until it turns a dark brown, about 10-20 minutes. Add the onions, celery and green pepper and cook until tender, about 7-10 minutes. Add the okra and cook for 10 minutes. Add the shrimp stock, tomatoes, paprika, cayenne, oregano, thyme, bay leaves, salt and pepper and bring to a boil. Reduce the heat to medium-low and simmer covered for 1-3 hours. Add the shrimp and cook until pink, about 3-5 minutes. Serve with rice and garnish with green onions and parsley. Option: For One-Pan: Make this a one-pan meal by adding 1 cup of rice and 2 cups broth or water (or 8 ounces of pasta and 2 1/4 cups broth or water) to the sauce after step 6 and simmer, covered, until cooked, about 20 minutes (or 12 minutes for pasta). Slow Cooker: Implement step 1, optionally implement steps 2-4, place everything except the shrimp, green onions and parsley in the slow cooker and cook on low for 6-10 hours or high for 2-4 hours before adding the shrimp and cooking for another 10 minutes. I cannot wait to make this. I love all your recipes. youre a GENIOUS. pass me some of your cooking skills 🙂 thank u! Just as an FYI, my Cajun relatives always put okra in their gumbo, no matter what kind it is. They also always start with a roux, so you had the right idea! Also, shrimp and crab together in gumbo is delicious! holy crap. That looks amazing! This looks really good – and relatively simple to make. I'll probably do it this weekend! We lived in New Orleans briefly when I was a kid and we've been fans of gumbo ever since. I really need to start making some at home and here you are with a delicious recipe. Recipe starred!!!! I love love shrimp!!! I have been wanting to try okra for quite some time. What does it taste like?? Next time try adding some andouille sausage. Also, file powder is a must, it has a subtle, wonderful influence. Also, serving with Crystal (Louisiana hot sauce) is good if you like it spicy. having said all that, this looks great! In my opinion, the roux is necessary to achieve the correct flavor. As always, this sounds AMAZING! It looks delicious! I can't wait to try this!! I've never tried gumbo before. I think I've been missing out! You have to have gumbo file powder for it to taste like gumbo. Without it is just stew. And just cayenne for hot? No. Love your recipes, but this is just wrong. Kevin, your food never ceases to wow. I could go for some gumbo, that looks delicious. Beautiful. Just like they serve it in Louisiana with the rice on top, not underneath. Why did you leave the tails on? And no Andoulle? Otherwise perfect. You should try using Alton Brown's gumbo recipe – you bake the roux instead of cooking it on the stove. It takes about an hour and a half for the roux to cook, but you get that wonderful dark coloring and complex flavoring from a long-cooked roux but you don't have to worry about it burning. Plus, other than stirring it a couple times, it's hands free, so you can either spend the time making your shrimp stock or kick back and watch TV. It's a great recipe. Anonymous: The baked roux sounds nice and easy. I will have Ito try it! Like Kevin says, buy whole shrimp and use the heads and shells to make a stock! Seasoning is very tasty, but I would cut the cayenne in half, especially since there is less liquid to dilute it. Easy enough to spice it up later. Also, feel free to fry the shrimp in butter ahead of time and use the lovely, brown, shrimpified butter to start your roux. I was very hesitant to make okra gumbo without a roux myself but one day I finally got the courage. I bought 4 pounds of fresh okra and chopped it along with a couple cloves of garlic, sprinkled on some olive oil and put it in a dutch oven. Bake it for atleast 2.5 hours on 275*. That'll cook down the okra. Then put it on the stove and pour the water and additional ingredients in. Also, you can freeze the cooked down okra in flat ziploc freezer bags to make gumbo in the colder months (fresh okra is not available or is much more expensive during winter months). What could I replace the Okra with? Or should I just leave it out altogether? I don't know if I can even get it in New Zealand. Zoe: You can omit the okra!